This workshop focuses on performance art as a site of learning, where the performance action is an experiment in which the end result is not known, either by the performer or the viewers. Instead, something is discovered through the process of doing the work, in the act of observing and experiencing change and transformation. Using performance, you might choose to learn something about yourself, about the world around you, or about the audience. The challenge is selecting materials and designing an action that allows you to effectively examine the question that you are asking. Unrehearsed, this kind of work is made in front of viewers. What is the role of the witness in the work? What does their presence allow you to do? Is there a way to involve them directly in the inquiry? How might they help you? Guided writing exercises will further develop your practice of constructing and analyzing your own work. 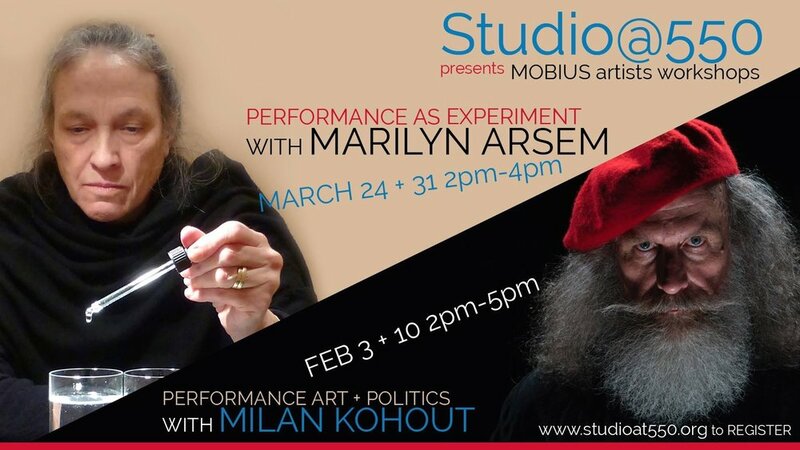 MARILYN ARSEM has been creating live events since 1975, ranging from solo performances to large-scale works incorporating installation and performance. She has presented work at festivals, alternative spaces, galleries, museums, conferences and universities throughout Europe, Asia, North and South America. In many of her recent performances, Arsem has focused on current political issues. Her site-specific performances respond to both the history of the site, as well as to the immediate landscape and materiality of the location. The events are designed to implicate the audience directly in the concerns of the work, to create an experience that is both visceral and intellectual. To accomplish this, she incorporates a broad range of media, and often engages all the senses. Sites have included a former Cold War missile base in the United States, a 15th century Turkish bath in Macedonia, an aluminum factory in Argentina, and the site of the Spanish landing in the Philippines. She taught at the School of the Museum of Fine Arts, Boston, for 27 years, establishing one of the most extensive programs internationally in visually-based performance art. https://en.wikipedia.org/wiki/Milan_Kohout Milan Kohout (now a US citizen) is originally from The Czech Republic. Here he got his M.S. in Electrical Engineering. He was an independent underground artist in so-called “Second Culture”. Later he becomes a member and art activist of the dissident human rights organization CHARTER 77 (group was nominated for the Nobel Prize in 1985 and initiated non violent Velvet Revolution). He was forced by CZ security police to leave his country in 1986 due to his political art activism. After two years in a refugee camp he was granted asylum in the United States. In 1993 Milan received his Diploma from the School of the Museum of Fine Arts in Boston. Since 1994 Milan has been a member of the Mobius Artists Group (www.Mobius.org). His work concentrates mostly on the subject of human rights (recently rights of refugees and Roma/ Gypsies) and politics (critique of totalitarian capitalism and religions) As Mobius Artists Group member he has participated on numerous international art exchange programs and festivals around the world (China, Thailand, Croatia, Taiwan, Czech Republic, Poland, Cuba, USA, Israel, Sweden, etc). and has been the recipient of number of awards, grants, residencies.